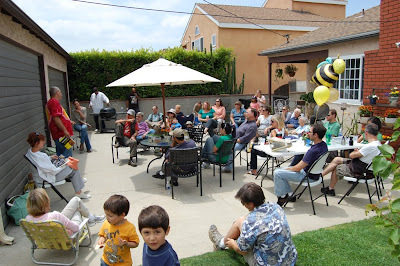 This month's meeting was graciously hosted by L'Tanya and Curtis. There was a good turn out and lots of questions with answers from Kirk. 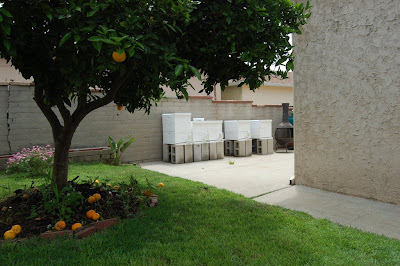 L'Tanya and Curtis's apiary is impressive - 5 neat hives in a residential backyard! My family couldn't stay for the whole meeting so we missed opening the hives. 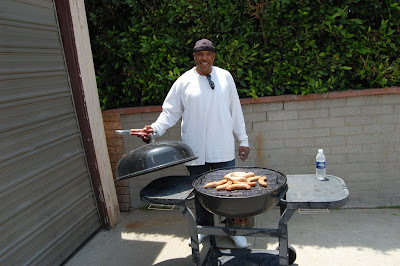 We also missed some delicious looking (and smelling) hot links that Curtis was grilling. Thanks for the hospitality Curtis and L'Tanya! I am looking forward to the next meeting as the months are inching closer to harvest time.